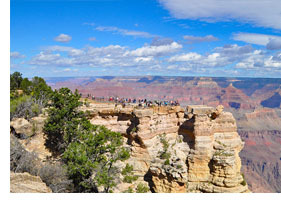 Learn which rim is best for your Grand Canyon sightseeing trip. 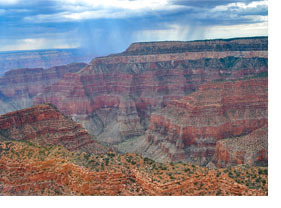 The Grand Canyon is an immense structure with spectacular views. There are three different rims you can visit, West, South, and North, each with their own unique sights, activities and experiences. So which rim is right for you? Are you in Las Vegas and want to travel to the Grand Canyon? See our tours departing from Vegas. Guano Point, meaning bat droppings, was named for an old fertilizer mine active in the 1930s. The ruins of the mine are still there for you to explore. See where movies such as Into the Wild and Next were filmed on location at the West Rim. Visit to an Old West town at Hualapai Ranch, with horseback rides, lasso lessons and even a mechanical bull. 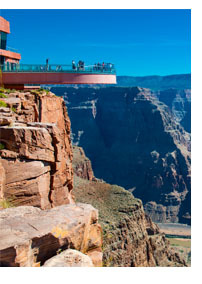 It's approximately 2.5 hours to drive from Las Vegas to the Grand Canyon Skywalk. Most helicopter flights take 45 minutes or less. The Watchtower - A circular, 70-foot-high re-creation of an ancient Indian tower. The Tusayan Museum - This features the 800-year-old ruins of an Anasazi village. Scenic drives, walking trails and lookout points. Popular hiking trails leading down into the canyon including the Bright Angel and South Kaibab trails. Driving time to the South Rim from Las Vegas is around 4-5 hours. Flight time is 40-minutes. Check out our helicopter tours to the South Rim. Point Imperial, the highest place on the North Rim at 8,803 feet. It overlooks the Painted Desert and the eastern end of the Grand Canyon. Cape Royal, which provides an amazing panorama up, down and across the canyon. Driving time from Las Vegas to the North Rim is roughly 5 hours.